After coping with the terrors of the Millennium Bug (what bug was that?) I awarded myself a month off with a view to doing some more serious trackbashing. I’d really have preferred a bit more daylight but my clients preferred that I was away when everyone else wasn’t, so we compromised on February and March when at least there’s a bit more leeway in the evenings. The target was still the former East Germany, as closure lists were still being issued at regular intervals and I’d decided that I should clear the ex-DR lines first before worrying too much about the former West. First bash of the new millennium, now I think about it. After a lost rucksack drama last night, resulting in yet another late night, a hideously early start was made in order to get 0550 Telford - Wolverhampton, courtesy of my long suffering life’s companion. The 0550 was a refurbished 158 complete with uncomfortable seats. On time arrival at Wolves allowed time for a really revolting ‘cuppa’ before 0649 to Euston. This was perfectly adequate and arrived 8 early at Euston, affording a comfortable connection via Victoria Line/Tottenham Hale on to 1030 Liverpool St - Stansted Airport. A long wait for Buzz’s 737 which provided a comfortable (full, but as on 19.12.99 I had a row to myself) and on time flight to Frankfurt. Half an hour at FRA (again) to get to the S-Bahn. F-Hbf travel centre, after much debate, said my EuroDomino was valid for ICEs but there were no seats on 1557 ICE to Hamburg so I settled for 1622 IR. A provisional booking was made for Wednesday night at Hotel Europa and refreshments obtained to avoid on-train prices. A 3½ hour journey to Hannover gave me time to rethink the plot and work out that by staying in Stendal considerable advantage could be gained tomorrow. Hope I can get a hotel room… The connection from Hannover to Stendal was another IR, 103 powered. Borussia Monchengladbach supporters [what must their chants be like?] much in evidence at Hannover, noisy and in some cases very tired and emotional, but seemingly harmless. Hotel am Bahnhof in Stendal duly obliged. DM85, breakfast at 0700 on Sunday and a room carefully selected away from the noise without me even asking. What more could you want. At last, a good night’s sleep! Breakfast was just staggering into life at 0715 and the bread needed a bit of coercion. Nice though, and I’m sure I won’t regret the cold pork, honest. [Because of a single food poisoning incident in Wolverhampton around 1970 I’m always convinced I’ll be ill after eating cold pork. I’ve eaten it many times in the intervening 30 years and never had the slightest problem! However, see below...] The shower took some getting used to as well, but delivered eventually. In general I’d rate the Hotel am Bahnhof highly recommendable. The booking office was shut and the notice said the ticket machine was on the platform. After an extensive search of the platforms it was found outside on the station forecourt. 0758 to Wittenberge arrived early, 143 propelled. Wittenberge is in a ‘V’ just north of the Elbe. 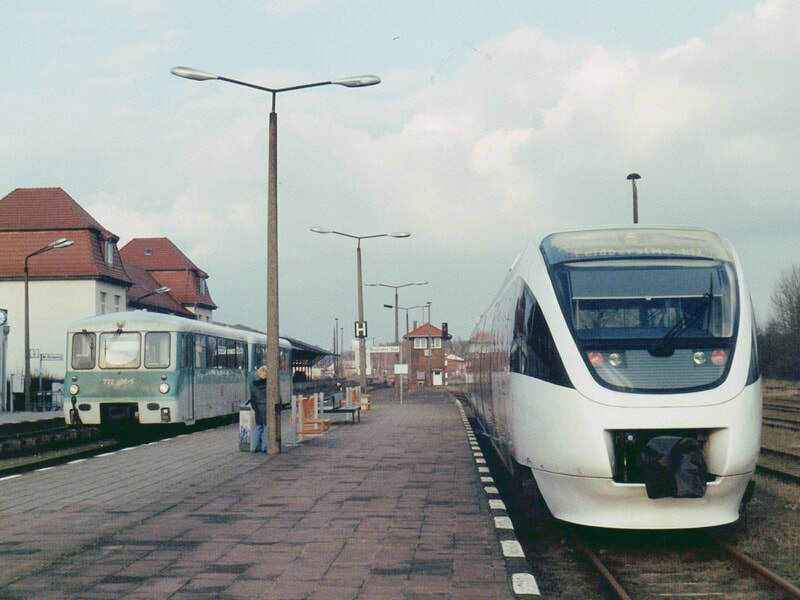 Trains from Stendal arrive at P6; the only trains north from there to the junction are 2-hourly IRs to Lübeck from Leipzig etc. REs to Berlin and Wismar both go from P1 so that side’s easier. Snow started at Wittenberge but doesn’t look serious. Yet. 2 late at Neustadt (Dosse) was no problem for a 9 minute connection. The Prignitzer Eisenbahn provided a venerable Ferkeltaxi in a startling blue and ‘dark pink’ livery. Particularly startling inside. An amiable driver was quite happy with my Wochenendticket - moral, do private lines at weekends and save any grief with the EuroDomino. Relaid track and a new bridge on the branch suggest it’s OK as far as Pritzwalk at least. 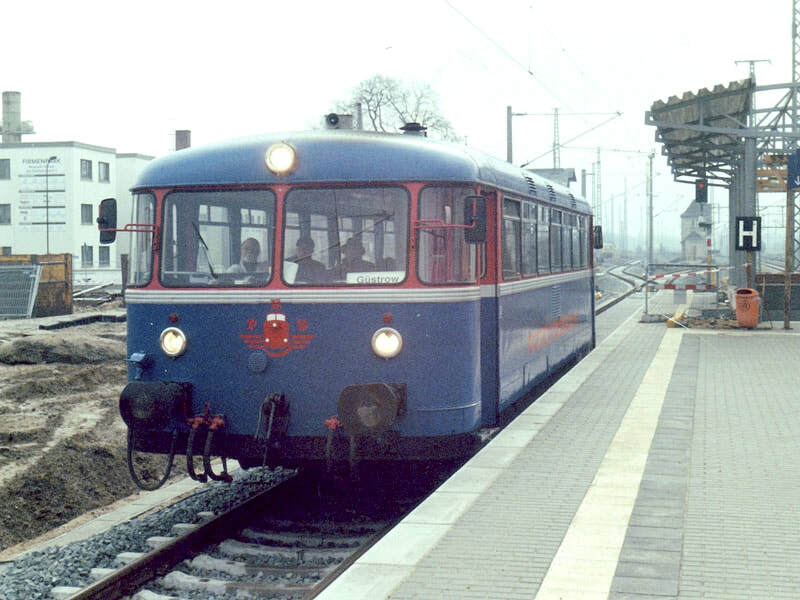 The southbound kart which we crossed at Kyritz was an ex Dürener Kreisbahn vehicle, so presumably this one is too. By the time the Ferkeltaxi got to Pritzwalk, the light was a stop or two better! The train is heading east at this point; I'm looking west towards Putlitz and Wittenberge. The line to Pritzwalk is seriously long, slow, flat and straight. Seriously. No sign of any freight other than some wagons at Pritzwalk. A local whom I spoke to at Pritzwalk had no knowledge of Meyenburg-Priemerburg closing which is curious, though as the company is based at Putlitz it wouldn’t involve any gaps in the network. I’ve just got the right word for the ‘dark pink’ - the livery is of course royal blue and puce. And only inside; it’s royal blue and red outside. [The Ferkeltaxi was really a sort of a Little Puce Coup(e), if you’re old enough to remember the Beach Boys, as I am.] The last bit of the line, north of Plau, gets more interesting (fortunately). From Priemerburg to Güstrow looks as if it’s worked as two single lines, so the decision to go through to Güstrow was a good one. 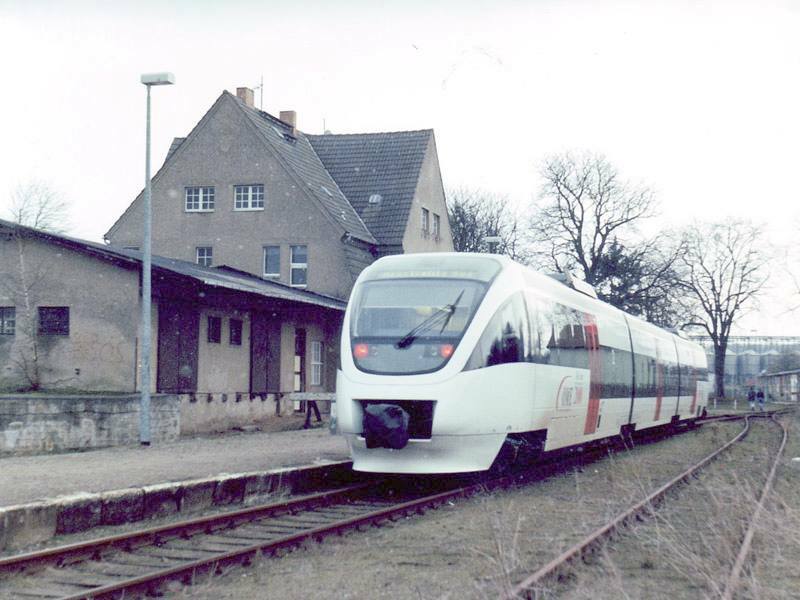 A very smart new 3-car articulated DMU of Ost Mecklenburg(ische?) Eisenbahn provided the connection on to Neubrandenburg, which took the left hand/northernmost line to Priemerburg, supporting the single lines theory. It also contained one of the most undisciplined children I’ve ever travelled with. Still, you can’t win them all. The line is quite a pleasant one, with gently rolling countryside all the way. Neubrandenburg looks a place to avoid. But then to be fair, so do Zittau and Skipton, from the railway. Uneventful run down to Neustrelitz Hbf with a 143 and squillions of students. Ah yes, it’s Sunday afternoon. Nestrelitz Süd turns out to be east rather than south of Hbf and only just across the road. To my surprise the Mirow train is a Ferkeltaxi and trailer but the Feldberg one is another of the OME artics. Reasonably well patronised as well; perhaps closure isn’t inevitable (or they all travel on Sundays only). A very slow run up to Feldberg (curiously, there is also a Bergfeld on the branch). The track is obviously very poor. At Feldberg it looks as if the track went over the road but possibly only into a factory. Photos were taken in half hearted snow and rapidly deteriorating light! On the way back the gricer:normal ratio was around 1:1 (4 of each). It appears that this was one of the Talent DMUs. The internal layout is excellent - spacious but well broken up and there are very large windows. The seats are awful though, and severe discomfort had set in by the time it got back to Neustrelitz. The modern OME unit looks distinctly out of place in the drab surroundings of the terminus at Feldberg. The line continued only a short distance to serve factories. This desperate photo is the only one I've got of Mirow, so it has to do. 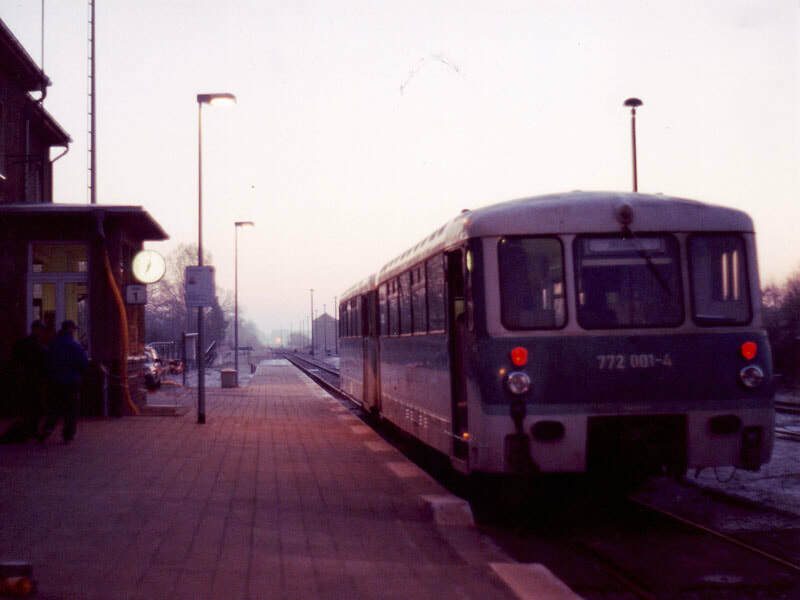 It's 0701 on 21.2.00 and 772 001 looks as if it's waiting for sunrise before working the 0706 to Neustrelitz Süd! 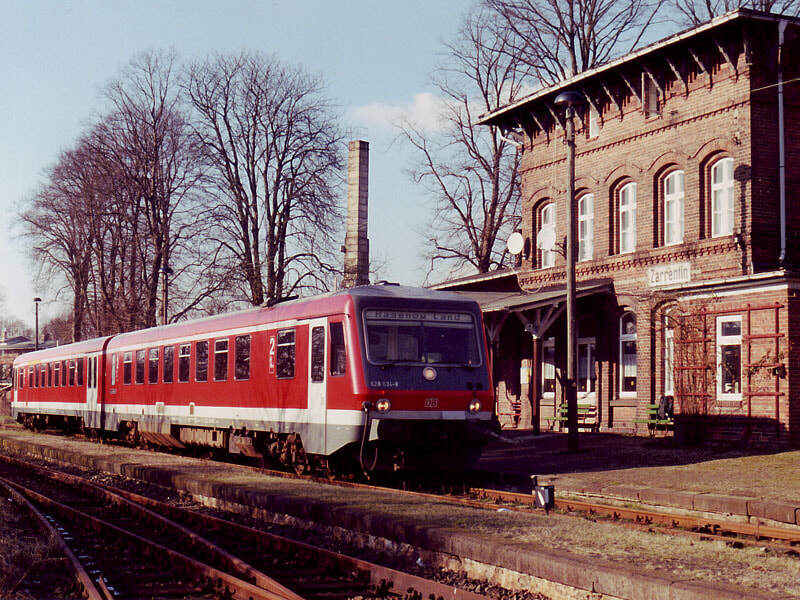 It seemed foolish to leave Neustrelitz without doing the Mirow branch (formerly through line to Wittstock). Hence the overnight stay, with the ‘master plan’ being to scoot down to Mirow on the 0622, then back for breakfast before departure on 0828 to Hagenow Land. On arising at 0530 there was an immediate and venomous reaction from the pork schnitzel which caused delay and put the whole scheme at some risk. I managed to get out at 0602 and had adequate time for a lengthy debate about small change with the lady at Nimm’s Mit who became quite angry and then most apologetic when she realised I didn’t understand her! The pork, fortunately, allowed me an uninterrupted trundle out to Mirow, in a mixture of highly technical daylight (just about the silhouette stage leaving Neustrelitz) and moonlight. It was starting to go light though, and there was enough for a photo at Mirow at 0701 (departure 0706). 1/125 at f1.8 with 400ASA film so not exactly dazzling. Mirow station seems to be right on the edge of town and has more the look of a country station, with a couple of sidings. A freight branch [Neustrelitz Hafen] diverges northwards a short distance up the branch; whether used wasn’t obvious though we passed a 345 further on which could have been on its way there. The condition of track seems OK so presumably it isn’t too threatened. Plenty of patronage as well with the 0615 arrival at Neustrelitz quite well filled. Oh, and very nice forest/lake scenery. Arrival at Neustrelitz was right on time at 0733, fortunate as there were 55 minutes in which to do the 10 minutes walk each way, get up to my room, pack, have breakfast, pay the bill and collect rucksack. In the end the whole thing took 45 minutes (less breakfast than usual) so I made the 0828 to Hagenow Land, a 2 car DMU from the bay platform, in comfort. Even on a sunny morning Wüstmark's a fairly forbidding station. 628 698 has just arrived from Parchim and is about to go back. The line beyond the unit continues to join the Hamburg-Schwerin main line. A cloudless morning improved the run, which could have been fairly dull otherwise. The countryside rolls, but only just! Long waits at Karow and Lubz, and some track that doesn’t seem to be too good, especially approaching Parchim. Given an opportunity to reconsider the plan I decided to bale out at Parchim and go up to Wustmark with a view to (possibly) repeating this morning’s stunt and going out to catch the early Wustmark - Schwerin train. If not that, then at least I’ll only have to do a short ‘out and back’ at some later stage. The gripper has just been round - thoroughly confused by my antics but obviously got the message as he returned with a leaflet about the Mecklenburg-Vorpommern day ticket, and then again with a local DB tourist booklet and a copy of the DB house paper, Takt. Back to Parchim to find the Hagenow Land train waiting [not the same one, obviously]. Yet more flat lands to be sat through. The junction at Ludwigslust is well north of the station, that at Hagenow Land is just beyond the station, which is in the ‘V’. The Zarrentin trains leave from the same platform as the Neustrelitz ones but from the western end (P1b). It doesn’t look as if overlap is possible, unless there are any through workings. More pleasant surroundings for 628 634, waiting at the terminus at Zarrentin. 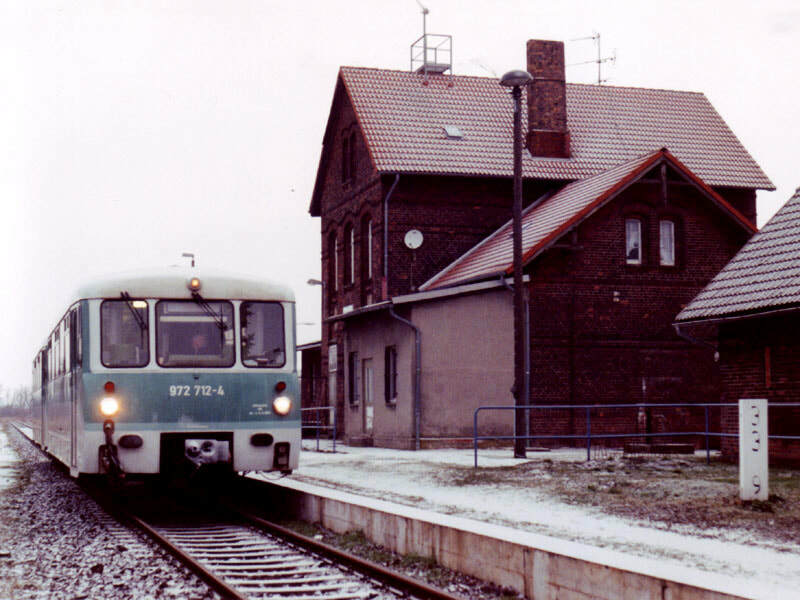 Here the line used to continue behind the unit to Ratzeburg on the Lüneburg-Lübeck line. Loads of kiddies on the Zarrentin train. All smokers, and ill mannered with it [unusual for Germany, on both counts]. Most of them got off at Hagenow Stadt and the rest at Wittenberge. Once again a pleasant but very flat amble to Zarrentin (pron. Zarren Teen) which is a nice little station with a sadly defunct bar (Hasserode). Timetable revealed that 0550 M-F runs through to Ludwigslust so would do the length of the platform at Hagenow Land if one were that bothered. In fact the platform at H-Land is a loop and the main line is used by ICs, presumably Hamburg - Berlin, which makes it even more academic. Back at Ludwigslust there was a quick (4 min.) cross platform connection on to a railbus + 2 for Dömitz. And what a dull line it is, apart from a very large field just outside Dömitz, adjacent to a stream or land drain and containing 6 deer and (rough guess) 3 to 4 hundred swans. At Dömitz two local ladies observed me photographing the unit and informed me they were on the way to a meeting campaigning to save the line. They also gave me a postcard portraying the destroyed bridge over the Elbe where the line continued to Dannenberg. 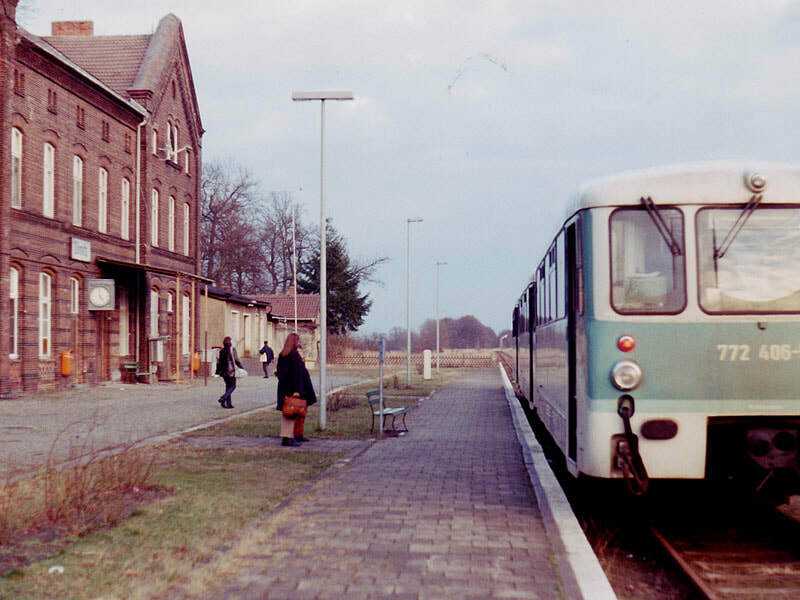 Another Ferkeltaxi took me to Dömitz, once a through station near the Elbbrücke on the Ludwigslust-Uelzen line, but an isolated terminus since WW2. Return to Ludwigslust was uneventful, with arrival about 1740. It looks unlikely that the 1809 IR will get to Schwerin in daylight but as things stand it’ll get done tomorrow morning southbound. It didn’t. On arrival the Hotel am Bahnhof opposite seemed a better bet than the InterCity next door and at DM89.50 it was, though not of the standard of the last two nights. Research into the trams revealed that I couldn’t get to Wustmark sufficiently late in the evening. Enthusiasm died at this point particularly as it was dark, so the very short remaining bit of the Parchim branch will have to wait until the height of summer when it’s light at 2145. [And so it did, but that’s another story. Nowadays it’s done all day every day by the Rehna - Parchim service of course.] A steak and a beer seemed far more appealing and Der Guten Quelle provided both after a wander round a deserted Altstadt. This place is also a hotel and well worth a try next time. [So why didn’t I? Forgot!] Steak and Erdinger were excellent. The Old Town in general looks a good bet for a revisit in daylight. Lots of old buildings nicely restored and an awesome (or even depressing) brick cathedral. Another bleak and chilly scene, this time at Rehna on 22.2.00 where 772 112 and its trailer, 972 712, are waiting to depart for Schwerin. Breakfast started at 0630 so a carefully orchestrated plan was carried out, to make the 0703 to Rehna. This was achieved with 4 minutes to spare, despite The Man at the hotel who was very pleasant but very, very slow (and wouldn’t take my NatWest Mastercard - Visa to the rescue). 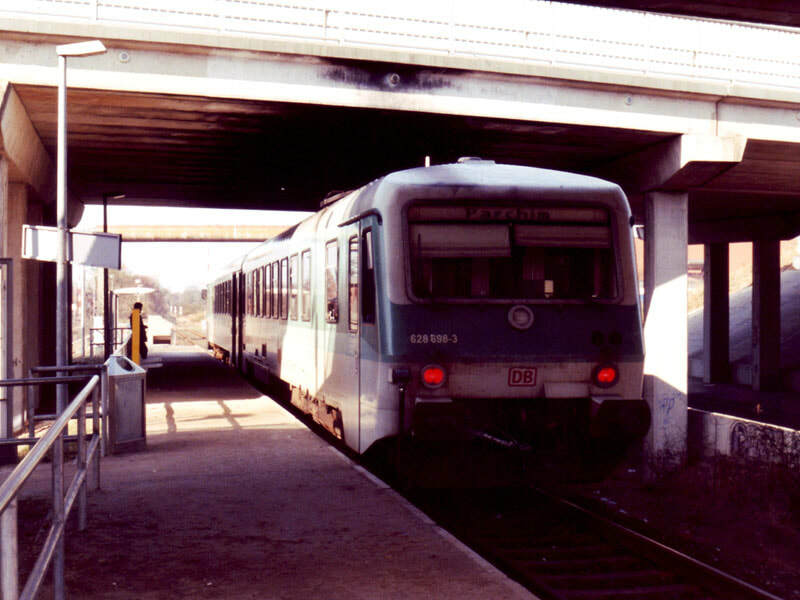 The 0703 to Rehna, billed as SE, turned out to be a Ferkeltaxi and trailer. Makes you wonder what they use for RBs around Schwerin. The gripper didn’t seem to know how to deal with a Eurodomino and seemed sure I didn’t want to go to Rehna. Pretty much as usual, in fact. The branch proved a worthwhile one - quite varied countryside and even some bends and gradients! It looks as if it continued beyond Rehna towards Lübeck and it’s pretty much on a direct line Schwerin-Lübeck. That being the case it’s odd that it’s quite lightly engineered and always single track. The alignment is such that not even a tilting kart would do very well. [In fact I think Rehna was always the terminus. Just wishful thinking on my part.] Rehna itself looks highly unexceptional with the traditional derelict factory beside the station. The village looked OK though as far as could be seen. On a fine summer morning this would be a really good line - unfortunately today there is cloud at 100ft and light snow! I even had to go down to 1/125 for the statutory phots. The snow had stopped back at Schwerin and held off during the 40 minutes refreshment and phone break. The 0921 IR turned up on time and provided warmth and comfort behind a 112 to Stendal (doing the junction to Stendal platform bit at Wittenberge of course). At Stendal the snow had set in quite seriously. Why do all the points have c. 10m clear of snow around the point blades but no visible point heaters? 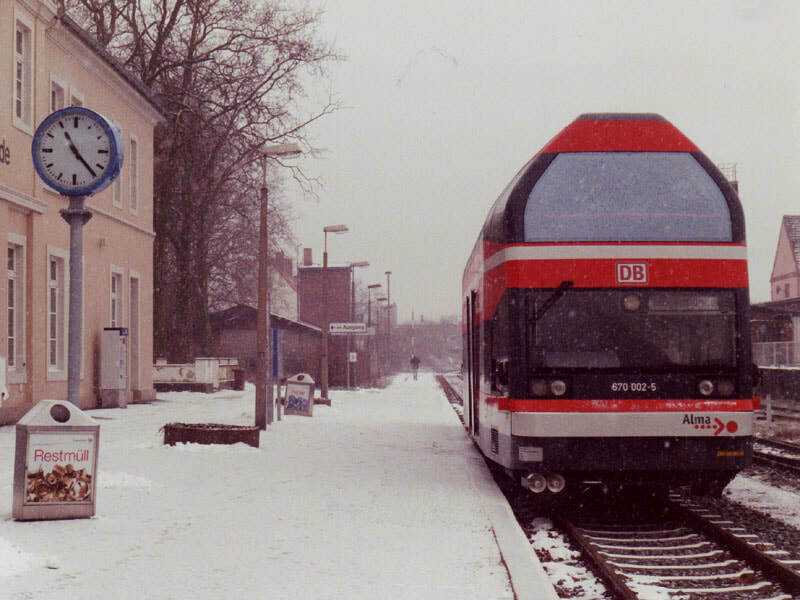 Later in the day it was snowing quite vigorously at Tangermünde, where double deck railbus 670 002 has just arrived from Stendal. The Tangermünde kart, 670 002, turned out to be a splendid device. Double deck and with a one piece ‘windscreen’ upstairs providing an even better forward view than a double deck bus. Surely the ultimate railtour vehicle. The ride is pretty awful but its other advantages (it’s surprisingly spacious as well as having a great view) outweigh this. The lack of a toilet could be a problem though obviously not on a 16 minute journey. As for the branch, it’s pretty boring. Straight, level, and beside the road almost all the way. A number of rail connected factories, seemingly all shut down. The snow gave up almost immediately and was busy melting on the return to Stendal. An RE provided onward transport to Magdeburg where a pre-emptive burger was acquired, thence a Dresden-bound IC to Halle. With time to spare I had a walk into town. Very unprepossessing as far as I got, with the only likely looking hotel the Schweizer Hof at the far end of Leipzigstrasse. Having noticed the station bar offering draught weissbier this seemed a far more attractive proposition than walking round Halle. It was - 0.5l of excellent Müller Weizen for a snip of DM 4.20. Highly recommended [and now shut, more’s the pity]. It was at quite a late stage when I realised that the clock in the bar was 4 minutes slow, not a good idea on a station! Fortunately P9 was adjacent, to the extent that 1439 Goslar actually rattled the bar when it came in. 2 coaches and a brake was no challenge for a 232 (232 195, not that I collect them you understand) and it was waiting time at Könnern where 771 031 was waiting in P3. Could be a long haul to Calbe. It was. Very poor track on the Könnern - Bernburg section - it will be surprising if this is not a closure soon. Better on the Bernburg to Calbe section which carries freight to/from a large factory, purpose unknown but a lot of conveyors and hopper wagons. The north side of the triangle is disconnected. 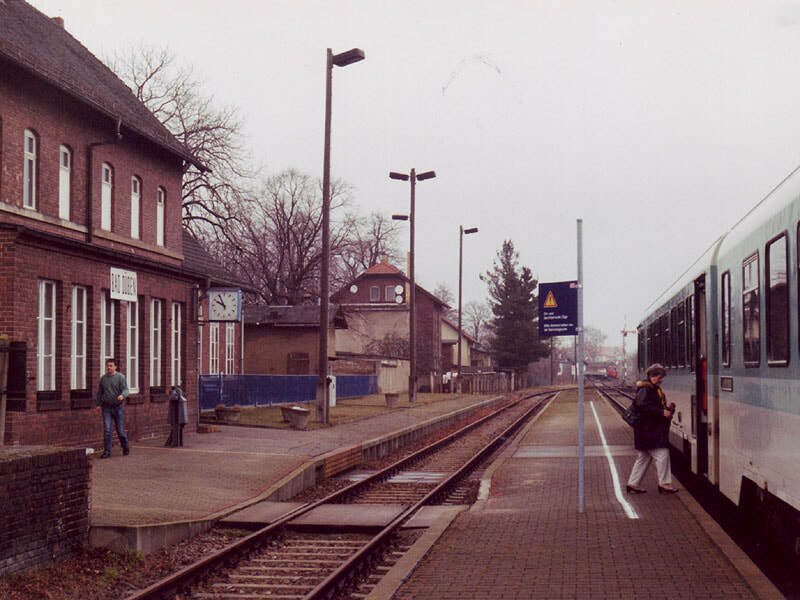 The Bernburg branch has a separate platform at Calbe (Saale) West but then joins the Güsten - Belzig line before diverging again to Calbe (Saale) Ost, surely one of DB’s more depressing stations. At Köthen (RB from Calbe, several hotels, one adjacent to station but price unknown) I went in search of the post office. Couldn’t find it. Probably got as wet as I ever have, but fortunately the rucksack kept most of it out. When I returned the 2-car DMU for Aken was waiting and provided welcome warmth. The branch is very unexceptional and there was not a great deal of traffic. Some factories at Aken (one derelict, of course) appear not to be rail served. Although only 1750 when the train arrived, daylight was getting technical and just too dark for a phot. Still daylight though. Still wet and cold, I retired to Dessau with a view to finding a hotel. Error. Definite mistake. There’s only one anywhere near the station and that’s in the ‘if you have to ask you can’t afford it’ class. I decided to retire to Leipzig and settled down in the station bar to wait (mediocre weissbier but at least there was a radiator to sit next to). Shock horror - it’s a fair week in Leipzig. A phone call to the Ibis elicited that they had rooms, at DM125 plus breakfast. At that price I’m not surprised. Back to Köthen therefore, after checking that the schedule for tomorrow would still work. It would, with an 0725 departure. The Hotel Stadt Köthen, next to the station, is a treat. You arrive, quaking, at a huge and intimidating door, Hammer Films style. Creeping inside nervously, you are met by a very friendly establishment providing B & B for DM90. What price the Ibis. Yeah, yeah, DM140, I know. Everything about the place is large apart from the receptionist. It turns out to be the former Hotel Kaiserhof, built 1840 when they knew how, etc., etc. [As I recall Berlin-Köthen was one of Germany’s first main lines so it may well have been the original railway hotel.] Room 210 was up two flights of creaking stairs, then via a long corridor lined with large radiators. It had a large Victorian wooden door and then a steel door; the only sensible reason I could think of was that they wanted to keep the original and the inner one was a fire door. Anyway, the radiator worked so I spread out the contents of the rucksack to dry and retreated to a pub up the road (also a pension, very friendly people, menu looked good, and the weissbier and the local Köthener pils went down well). This might well be an even cheaper alternative to the admirable H.S.K. A comparatively leisurely start with breakfast at about 0635 (it starts at 0600). Very good too. I departed much refreshed at 0710 to find a dry morning and a Rabbit (218 102) on the 0725 to Dessau. 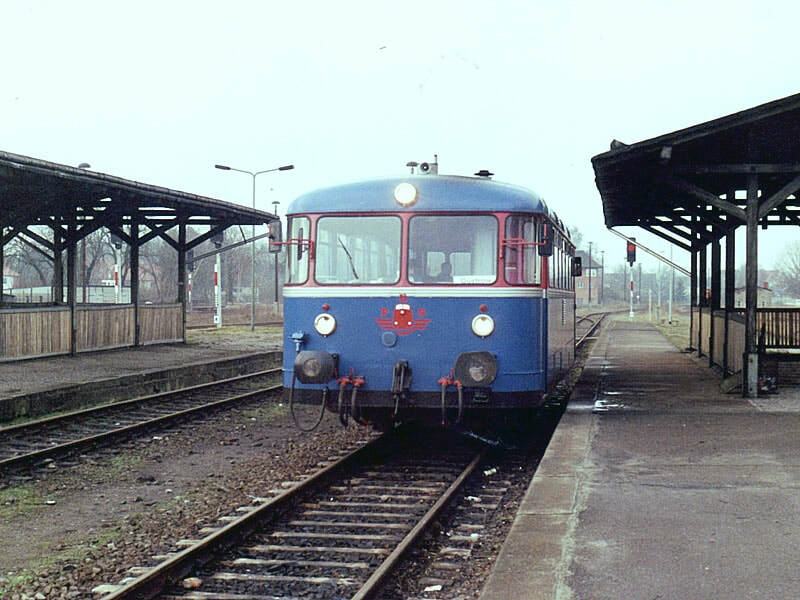 A short wait was required at Dessau before 0809 to Lutherstadt-Wittenberg, a 2 car push-pull 143 powered. Even in daylight there were no hotels to be seen at Dessau. The times are changing at Lu-Wittenberg; unlike my first visit in 1992 there seems to be a plethora of hotels, as well as phone boxes. I thought this visit to Bad Düben on 23.2.00 would be my only one - somewhat to my surprise I was back there a couple of months later on a steam special from Leipzig. The lady conductor on the kart to Bad Düben seemed pleased to have a passenger beyond Bad Schmiedeberg - I was the only one, though. Four more appeared at Bad Düben, which was without doubt the most exciting thing in the whole 2 hours. A new bridge is being built over the Elbe; unfortunately this will require a revisit to Lu-Wittenberg - Bitterfeld at some stage. The Torgau line appears to have some use although not regular - it is not heavily rusted at Pretzsch. South of Pretzsch there are at least two freight branches, one disconnected and the other looking disused. Lutherstadt-Wittenberg to Bitterfeld filled in a gap. So, really, did Bitterfeld - Stumsdorf though this was moderately interesting with a huge and hideous industrial area leaving Bitterfeld then a long roadside stretch with numerous crossings. At Stumsdorf the Bitterfeld trains seem to be the only users of P3 which they enter from the south. The physical junction is well to the north of the station and there appear to be no through workings. So ended the gricing part of this trip, with return to Halle on a 143-powered local. At Halle I had 20 minutes to await 1338 IR to Frankfurt which neatly provided time to procure a smoked ham baguette (no mayo, praise be) and pay a return visit to the station bar for another enjoyable Müller weissbier. The IR turned up on time, somewhat full but I eventually found an empty compartment (so far - written at Merseburg!). A long but punctual trudge all the way to Frankfurt Süd, then we were held for signals and were a minute or two late into F-Hbf. The reservation at the Europa was still in being. [There were some comments at this point about the Europa and Frankfurt generally, but I thought it best not to transcribe them…] The travel centre at F-Hbf sold me a Eurodomino for Her Ladyship [she was joining me on the next trip in a couple of weeks] after a very long wait, and confirmed that the latest timetable is the 26.9.99 one. There is a supplement to the May one if required. The prompt arrival of 0817 S-Bahn to the airport saved me from an inebriated gentleman with no socks. Even the winos speak fluent English in Frankfurt. On arrival at the airport Buzz was 7 late. Then 15 and finally 20. Nearer 40 by the time the 737 was airborne into cloud which seemed to go all the way to 35000 ft. Arrival at Stansted was about 1058 and I made 1115 to Liverpool St by a hair’s breadth as the plane had only 24 on, and the Buzz man at Frankfurt had let my rucksack pass. The WAGN 321 is (I hope - Virgin West Coast still to come) by far the roughest riding train of the week. Indeed it was, after a sojourn in the Archery Tavern the VWC to Birmingham was fine. Thence on to Telford with Central Trains, ready for (another) quiz defeat. Only a couple of weeks elapsed before I returned to Germany with Mrs EG, to use up the remainder of my month off. The weather was pretty bleak, but at least I've got the photos!